The Borneo Orangutan Survival Foundation (BOS) is a nonprofit environmental foundation organization located in Balikpapan, Indonesia. BOS is active in many fields. The main goal of the organization is to protect orangutans and the natural habitat they live in. The wild orangutan is at risk of becoming extinct. Wild orangutans live in Indonesia and Malaysia. The number of wild orangutans is decreasing rapidly every year. Orangutans are unique, highly intelligent animals that share 97% of their DNA with humans. Orangutans are one of four great apes and only live in Asia in Indonesia and Malaysia. The orangutan is the largest living tree mammal in the world. They spend most of their lives living in trees, building nests each night to sleep at the top of trees. BOS has two main programs it supports. The first program is called Wanariset. Wanariset is the largest legally operated orangutan reintroduction project in the world. Wanariset was first founded in 1985 by Dr. Willie Smits, the founder of BOS. The funding for this project comes from many areas including government, sponsorships of individual orangutans, membership fees, and corporate and private donations. 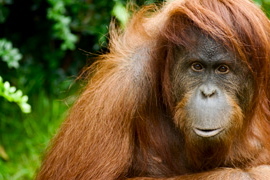 As of April 20, 2005, BOS has over 520 orangutans they care for. The cost to save one wild orangutan is approximately $1,000 US dollars. The second program is called Nyaru Menteng. Nyaru Menteng’s goal is to rescue the animals from the forests that are being cleared for Palm-oil plantations. Much of the land of Borneo is being cleared to plant large palm-oil plantations. This puts the orangutans at risk because their natural habitat is being destroyed, forcing them go out in the open where they are often times being hunted or caught for food or entertainment. Scientists estimate that wild orangutans are disappearing at the rate of 2,000 a year and will be extinct in 10 years. BOS and it’s sister organizations throughout the world have made considerable contributions to the lives of orangutans. BOS can be found in Indonesia, United States, Netherlands, Australia, Germany, Austria, England, Japan, Canada, Denmark, Sweden, Switzerland and France. All the BOS organizations are considered nonprofit organizations in their respective countries, with most of them registered in multiple countries. There are many other nonprofit organizations that focus on orangutans, but none as established or effective as BOS. Australia, Sumatra, and Indonesia all have their own orangutan protection organizations. BOS, however, is so effective because it focuses on at least four different areas: protection for existing orangutans, orangutan reintroduction, conservation educational programs, and funding research. In particular, the organization works to protect forests by stopping the destructive impact of logging and to fight poaching by helping communities develop long-term plans for alternate sustainable incomes. This entry was posted in Endangered Species, Forest Fires, Habitat Destruction, Illegal Logging, Indonesia, VolunTourism and tagged Adventure Travel, Eco-Tourism, Sustainability. Bookmark the permalink.